The cat and the moon rainbow, Ormos Varko. We have been working hard on our latest website commission recently and yesterday it finally 'went live'. We're very pleased with it and, more importantly, so are our clients. See what you think here: www.villaoctavius.com If you're a sailor you may be interested in the video on the About Us page. As well as working we've had a few nights at anchor, and also nearly a week in Vathy where we sat out a few days of bad weather. This gave us the opportunity to crack on with work, and also to meet up with friends Samir & Lesley, who were here on a flotilla holiday. Sadly we met up only the once during their time in the Ionian, due to our work commitments and their changing schedule, but it was good to catch up. It was also good to catch up with some fellow Odyseas Marina berth holders, returning from the UK for a few weeks of autumnal sailing. Anyway back to The Storm. 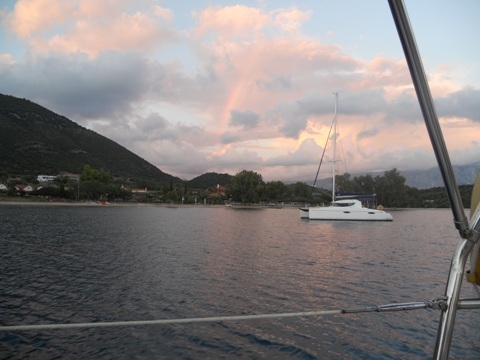 There had been no mention of rain or thunderstorms on any of the forecasts we had seen and, having spent three days on the Neilson pontoon in Nidri working on our latest website commission, last Thursday we were eager to spend some relaxing time at anchor. This we did for an hour or so and then thunder started rumbling and the skies all around turned dark within about 10 minutes. For the next 2 hours we endured the most extreme thunderstorm we have experienced so far - very heavy rain for a short while, very loud thunder and the most spectacular (read frightening with some 16 metres of aluminium extrusion sticking up into the sky) lightning we've ever seen. Oh and 40 knot gusts. We were confident our anchor was holding, and there were only four other yachts nearby, all downwind of us. Unfortunately one of them had only recently arrived and anchored with lines ashore, inside our swinging circle. As it happened, the strong gusts were blowing us away from it and, despite the thunderstorm, the wind stayed in a fairly consistent direction. Nevertheless, we had the engine running for nearly two hours in case we had to make a hasty exit - the idea being that once a diesel engine with a mechanical fuel pump and little in the way of fancy electronics is running, it will continue doing so even if the worst should happen in a thunderstorm, whereas it might not start if it wasn't previously running. We held station and, after a couple of hours when things began to calm down, we did re-anchor further out. After another hour, all was tranquil, although lightning continued for some time. We had an uncomfortable, cold and somewhat alarming couple of hours, but nothing worse than that. Elsewhere on Meganisi, people had a far worse time - dragging anchors, bouncing pontoons, power cuts and we've been told even a Mayday was called from Port Atheni. And the Neilson pontoon we'd left just a few hours previously, for all its liveaboard usefulness, is not somewhere we'd choose to be in a storm. We've since heard it reported that someone who has been in the Ionian for decades said that The Storm was the worst they've ever seen, so all in all we were pretty lucky. We spent a further similar day at anchor before returning once more to Vathy to continue working. 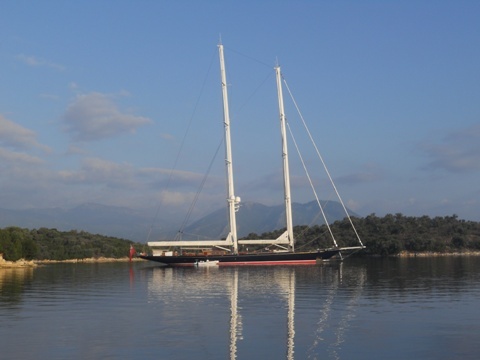 We have stayed longer than intended as we were going to meet up with a friend of Ann's on another flotilla on Monday, but their route was rescheduled to avoid the Ionian Regatta in Sivota today, so we hope to meet up for a Mythos or two later today.